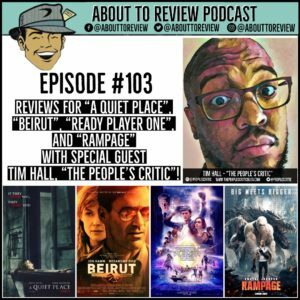 This week’s episode with guest Tim Hall is jam packed with four different reviews for movies that are all currently in theaters! The indie horror film “A Quiet Place”, hostage thriller “Beirut”, nostalgia extravaganza “Ready Player One”, and video game adaptation “Rampage”. Thank you so much to the one and only “People’s Critic” for taking the late night call to make this episode happen!